Nation narrates the tales of their bravery and the American Military commemorates their sacrifices. Stubby, Nemo, Chips, Smoky and many more have laid their lives and served the US army. History has witnessed the intrepid warriors our canine family has been. K9 Corps – the trained military dogs that serve the nation on borders need no introduction. They have continuously proved their mettle on the battleground! Many states across the country have already been organizing parades and other activities to honor these brave hearts. Being a pet parent yourself, treating your own fella with gratitude and making the day special for it could certainly be a way to pay a small homage to the most loyal pet of all times. How to Treat Your Dog? When you get back home, your pet is always there to greet you at the door, wagging its tail. Isn’t it? That’s the love you should treat it back with. Scratch its ears and pet your pooch as much as possible. Bribe it with a toy and cuddle a lot. You can show your appreciation towards your pet by bringing in some treats like – dog biscuits, baby carrots, chewables. Buy a nice collar: Collars can be a great gift for your pet that loves to go out and about. A seresto collar will help keep your pet safe from fleas and ticks infestation, a major cause of some serious health issues in canines. Dogs are explorers, and thus go crazy when they get the opportunity to ramble. Not to mention, the car rides that they most enjoy. Another great option is to take him to a dog park or if possible, visit a K9 Veterans Day Parade. Definitely, this would be a great way to show your love towards canines. And possibly, may turn out to be a great outing for your pet as well. 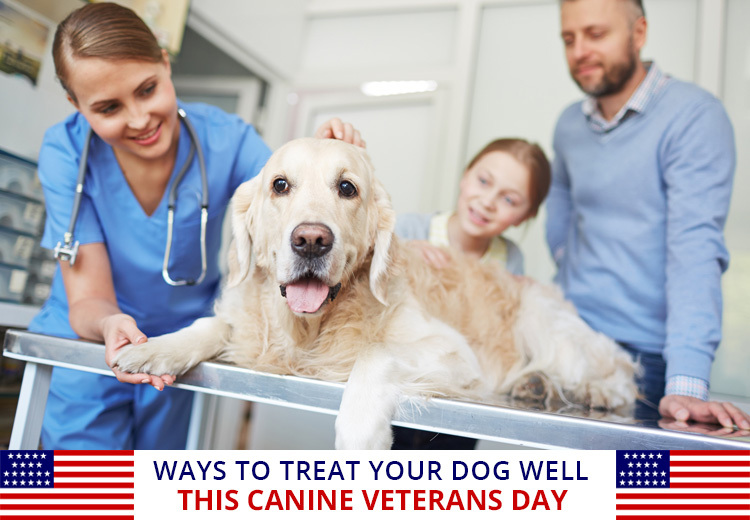 A canine veterans day is about taking care of your dog. Visit the vet for your pet’s regular health check-up and ensure he is hale and hearty. These small gestures and activities make a big difference in your pet’s behavior towards you. It also helps them stay healthy, happy and agile. What better tribute than up-keeping the health of your pet? So, just plan and make this K9 Veterans Day extremely special for your four-legged warrior!